Last night, Lorin Maazel returned to guest conduct the Boston Symphony Orchestra in a program of orchestral and vocal works by Mozart and Ravel at the Koussevitzky Shed at Tanglewood. 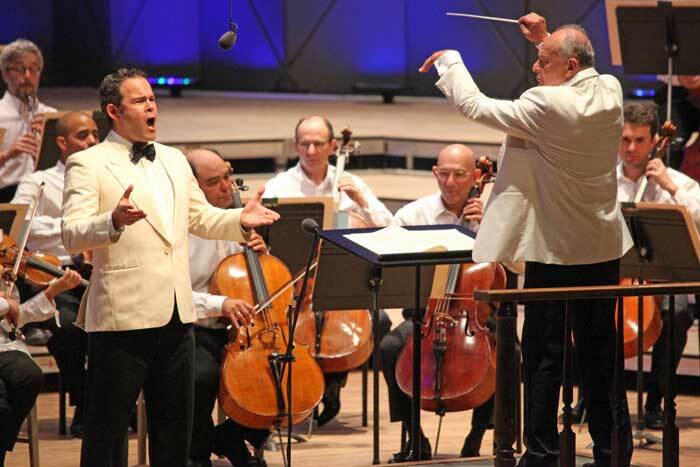 He was joined by bass-baritone Gerald Finley, fresh from a triumphant recital the previous night in Ozawa Hall. (BMInt reviewe here) In the Sonata-Allegro first movement of Mozart’s Symphony No. 38 (Prague), which opened the program, Maazel indulged his tendency to change tempos, particularly at transitions, then to launch back into the original tempo in the next section; this exposed synchronization problems. There also were balance problems: despite antiphonally divided violins, the lower strings seemed overmatched (they were hard to hear); and brass not only stuck out over woodwinds, but they both sounded too loud for the strings. On the whole, the first movement lacked pulse or rhythmic propulsion, and the balance problems and rhythm problems made for muddy counterpoint in the complicated development section. In the slow second movement, there was more interventionist Maazel, bringing out crescendos and pulling back in unorthodox spots. Still, the orchestra played elegantly and chords sounded balanced and judiciously weighted, so that the movement, though unconventional, sounded pleasant. The finale had the rhythmic punch that the opening movement lacked, and was played with less fuss, making the conclusion more satisfying. Finley joined the orchestra for three arias from Mozart, with texts by Lorenzo da Ponte. “Rivogete a lui lo sguardo” was originally written for Guglielmo in Act I of Così fan tutte but was removed from most performances and performed as a separate concert aria, K.584. Perhaps this segment of the text, “che gli uguali non si trovato da Vienna al Canadà” (that no equals can be found from Vienna to Canada) appeals to this Canadian baritone singing music from a Viennese opera! Finley made a fine case for the aria with a sterling crescendo on “certo io sono, e egli è certo” (I’m certain, and he’s certain), and he also made amusing musical onomatopoeia on the text, “Se cantiam col trillo solo” (If we are singing with one trill). This was followed by a rousing rendition of the Count’s aria from Act III of Le nozze di Figaro. Finley is one of the great Counts of this generation (he’ll make his Metropolitan Opera debut as the Count this fall), and this performance demonstrated why, with his superlative diction, even tone up to the ringing F-sharp, and incisive but never overplayed acting. The aria set concluded with “Fin ch’han dal vino” from Act I of Don Giovanni, sung at a brisk, aggressive tempo without ever losing control. Maazel and the orchestra provided fine, detailed support under him throughout. After intermission, Maazel returned to the podium for Ravel’s Alborada del gracioso. This time, Maazel’s fussiness and attention to detail paid dividends; the performance was full of flavor and color, and orchestral balances were exquisite, down to one segment where I’ve never heard a harp and trumpet actually match tones and dynamics before. Finley returned to the stage for the Don Quichotte à Dulcinée song cycle, Ravel’s final compositions that were originally intended for a movie based on the story of the infamous knight-errant of La Mancha. The songs suit Finley’s burnished bass-baritone voice admirably; every climactic F-sharp rang impressively, the prayerful endings of the “Chanson romanesque” and “Chanson épique” were delivered with an exquisite hushed pianissimo, and Finley provided joyful simulations of dissolute drunkenness in the “Chanson à boire.” Maazel and the orchestra played beautifully, shaping the rhythms of the opening “Chanson romanesque” (the same rhythm used for Alborada) while also keeping those plangent dissonances that remind the listener that this “Romantic Song” is coming from an unbalanced mind. Unfortunately, there were problems with synchronization between singer and orchestra at moments of each of the three songs, providing an unintended sour note. The concert concluded with the second suite from Ravel’s ballet, Daphnis et Chloé. This orchestral rendition of the final scene is filled with fine details of orchestration, complex rhythms, and here, the results were dazzling. From the seething, undulating undercurrents that give rise to the opening “Daybreak,” to the sinuous, sensuous “Pantomime” (with particularly fine, seductive solo flute playing from BSO Principal Elizabeth Rowe) and the orgiastic explosion of the final “Danse générale,” Maazel seemed in his element, serene and tranquil as the orchestra surged and raged before him, but always in control and bringing off all manner of effects in spectacular fashion. It was nice that the concert at least ended on a sweet note.